An autopsy conducted Wednesday was inconclusive; the cause of Ellis' death remains under investigation, according to the Bexar County Medical Examiner's office. Because of his symptoms and the large amount of water he drank, race officials believe Ellis died from low salt content in his blood, known as hyponatremia. His funeral arrangements are pending at the Weed-Corley-Fish Lake Travis Funeral Home in Lakeway. Reached by phone, relatives declined to comment. In addition to Ellis, another paddler was taken to the hospital in Victoria for kidney failure after he finished the race. He is expected to be released in a couple of days. Although Ellis was new to canoe racing and this was his first Safari, he was already well-liked. He and his racing partner, Ian Rolls, were known for being polite, saying “yes, ma'am” and shaking hands with their competitors. They were also prepared and fast. Other racers knew that Ellis drank more water than most competitors but had compensated with extra electrolyte pills and salty snacks. “They were very good paddlers,” said Michael Shively, who won the aluminum class with his partner, Jim Pye. Ellis and Rolls were racing in the same class as Shively and had won the aluminum class in the preliminary race for the Safari. Shively, who has won the Safari several times in multiple categories, saw them as his main competition. Ellis and Rolls looked strong at the start of the race. But at the Gonzales checkpoint, Mile 85, Ellis was not feeling well. Such symptoms are normal for the Safari, especially on the first night of paddling. But Ellis was not recovering after they left Gonzales. Cayla Weber and her sister Courtney Weber were the first to come upon them. “You could tell he was really in bad shape. He was just lying there wheezing,” Cayla Weber said. Rolls was screaming for help, the Webers said. He had just pulled Ellis out of the river after he had collapsed in the canoe and fallen in. The girls pushed the 911 button on their emergency satellite beacon, gave it to Rolls and then turned around and paddled back upriver to find another boat that might have a cell phone. They found Ginsie Stauss and Joseph Geisinger. “He was yelling ‘help me please, he is dying',” Stauss said. Stauss called 911 to relay their GPS coordinates. Jason Rotan and Cody Ackermann had arrived by then. Ackermann, a river guide, had basic emergency medical training. The medics then arrived, assisted by a nearby landowner. After helping strap Ellis onto a backboard so he could be moved, the canoe racers knew they had done everything they could and headed back down the river. They would not learn of Ellis' death until paddling for another day. Ellis' death shocked those who knew him, including many who were familiar with his online persona, “Concho Man,” on TexasBowhunter.com. Paul Gonzalez Jr., 35, met Ellis at the online forum's annual barbecue. The two immediately clicked, Gonzalez said, possibly because of their mutual love of the outdoors and for Texas music. Ellis worked out nearly daily, either in a spin class, running or rowing, Gonzalez said. He was extremely close with his family, younger siblings Blane and Brooke, and was a terrific friend. Ellis was an organ donor, Gonzalez said, adding that the act had taken him by surprise. On a clear Saturday morning, kayaker Pat Keller bobbed in the water waiting for the 2014 Great Falls white-water race. At the sound of the start, the 28-year-old bolted downstream, guiding his boat smoothly through the waves and waterfalls of some of the country’s most demanding and dangerous rapids. It was an adrenaline-fueled experience for Keller and each of the 31 other kayakers who came from as far as New Zealand to participate in the race, but one that this year was far from guaranteed. Almost twelve months ago on the same frothy stretch of the Potomac River, 23-year-old kayaker Shannon Christy of North Carolina drowned while training for the annual race days before it was to take place. The 2013 event was canceled, and instead a memorial for Christy was held on the river. This year, race organizers faced a weighty decision on whether to proceed with the event, according to race director and six-time winner Jason Beakes. But support from the kayaking community, in the Washington area and beyond, convinced Beakes and other race organizers that this year’s competition should go on. At a meeting for racers Saturday morning, national-champion kayaker Geoff Calhoun, 28, led racers and volunteers in a moment of silence honoring Christy. According to Beakes and Calhoun, last year’s tragedy showed the already safety-conscious group of race organizers and competitors that more needed to be done to ensure the safety of paddlers during the event and at informal practice sessions. Groups of kayakers usually take new or dangerous sections of river slowly, often getting out of their boats to scout rapids from shore or to “set safety” with long throw ropes. Racing changes this approach, as paddlers challenge themselves to run drops as quickly as possible. This focus on speed can make practicing for a race as dangerous as the race itself. At a practice session Friday, kayakers armed with throw ropes stood watch on rocks in the center of the Falls as fellow paddlers dialed in their lines. During Saturday’s race, the number of safety personnel grew, with volunteers anchored to rocks and in boats above and below every drop on the quarter-mile course. Local authorities and the National Park Service allow the race and have been supportive of kayakers’ efforts to improve safety. SUMMERSVILLE, W.Va. -- Authorities say the Gauley River's third victim this season was a 55-year-old man from Meadville, Pa. The victim, whose identity is still being withheld pending notification of his next of kin, was a veteran kayaker, said Jeff West, chief ranger for the New River National River in Glen Jean. In fact, West said the man had about a decade of experience kayaking on the Gauley. 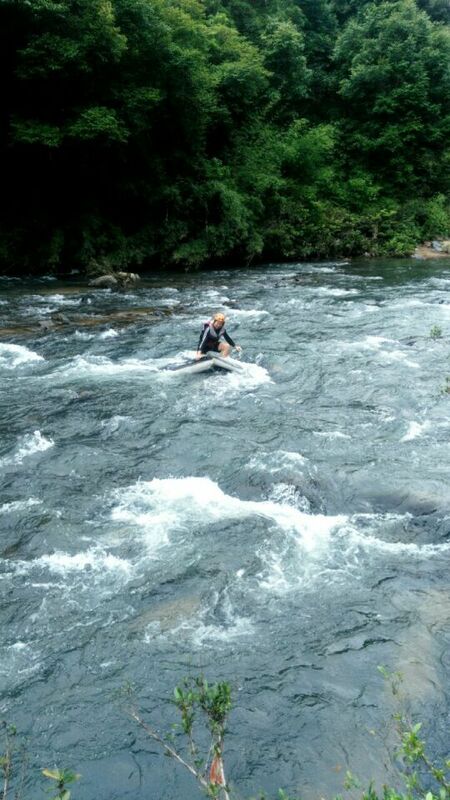 "He had actually kayaked the lower Gauley River the day before the accident happened," he said. "He was a very fit man, an outdoorsman." This is the third fatality of the 2010 Gauley season, which started five and a half weeks ago. The season will end Oct. 17, West said. The man was kayaking with friends when he overturned his craft at 1:25 p.m. Sunday about four miles below the Summersville Dam, West said. He became pinned under a rock near Camera Rapid. Bystanders were able to reach the man "within minutes" but were unable to free him from under the rock. By the time the man was freed, he was not breathing and was unresponsive, West said. "I'm not sure how long it took them to get him out of the river." West believes three fatalities is the most that has occurred on the Gauley River since rafting became a big draw in the early 1980s. But this is the second year in a row that number has been reached, he said. The first victim was Jiyang Feng, a 19-year-old sophomore from the University of Illinois. Feng was from Dalian, China, according to previous media reports. She fell out of a raft about 9 a.m. on Sept. 19. The next day, Matthew Hanes, 21, of Cleveland, Tenn., -- who also was experienced on whitewater -- became the second fatality on the river when he fell out of a raft. "He was a guide on the Ocoee River in Tennessee," West said. Estimates of how many people raft and kayak the Gauley range from 10,000 to 30,000. "The Gauley River has Class V rapids, and Class V rapids are dangerous," West said. "And people come to raft the river because there is an element of danger." Whitewater racing is fun and exciting, but there are some real risks. Racing makes any run more strenuous, and it's harder to control your boat at race speeds. On May 24th Nathan Vernon was killed at a Whitewater Festival on the Eagle River at Dowds Chutes.. This event, which advertised itself extensively with the tag line, "Winners will be rewarded; losers will be resuscitated", was held on the class IV+ Dowd Chutes of the Eagle River near Vail, CO. The race was 1500 meters long, roughly 3/4 of a mile. The river was running at 3.5', or 1340 cfs, at the gauge at Gypsum. This is a medium low level. 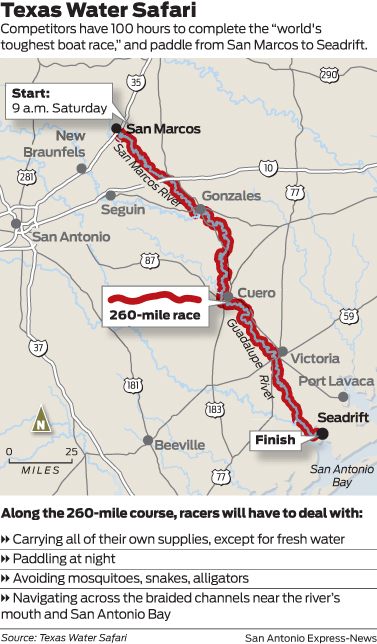 The altitude, well over 8,000 feet, made the race unusually tiring. Reports posted to the internet and forwarded by Colorado Whitewater Association Safety Chair Roger Lynn described the incident as follows: Vernon, a third year kayaker, capsized halfway down the course just above the most turbulent section. After two roll attempts he slid out of his kayak. Initially conscious, he appeared to lose consciousness and floated face-down for the rest of the rapid. Two throw ropes hit him without response. Several safety boaters grabbed him, flipped him over, and got him to shore with some difficulty. Rescue squads were on hand and CPR began at once, He was taken to Vail Valley Medical Center, where he was pronounced dead. The official cause of death, based on an autopsy, was heart failure. The Vail Mountain Rescue Team is a well-trained unit. They provided excellent safety coverage and were augmented by chase boats stationed throughout the course. Two comments were made by observers. First, many safety boaters were paddling very short rodeo boats, great for playing the river, but not ideal for rescue. Second, this is an ideal site to set up a tethered swimmer rescue using a rescue PFD. This is often done European races and makes it easy to recover an unconscious person in whitewater. Neither change would have made a difference in this case. Given the heart problem, Vernon probably could not have been resuscitated. 1. Recovering from a flip during a race can be very challenging because the racer is out of breath and often rushes the roll. This must be considered by anyone competing in similar events. 2. The Vail Mountain Rescue Team is a well-trained unit. They provided excellent safety coverage and were augmented by chase boats stationed throughout the course. Observers made two comments. First, many safety boaters were paddling very short rodeo boats, great for playing the river, but not ideal for rescue. Second, this is an ideal site to set up a tethered swimmer rescue using a rescue PFD. This is often done European races and makes it easy to recover an unconscious person in whitewater. Rob Kehrer, pictured here during the 2013 Alaska Mountain Wilderness Classic, was a 10-year competitor in the race, which is among the state's most grueling backcountry competitions. Kehrer died during the 2014 Classic while attempting to raft the Tana River. The inevitable has happened in the 32-year-old Alaska Mountain Wilderness Classic, and 44-year-old Rob Kehrer is dead. A 10-year veteran of what some consider the toughest wilderness challenge in the world, Kehrer died in the Tana River of Wrangell St. Elias National Park and Preserve on Saturday after apparently launching his packraft a little too soon at the end of the lower river canyon. Friend and traveling companion Greg Mills told park rangers he saw Kehrer's boat disappear into a boil of cold, glacial water from which it never emerged. "As soon as Rob put in, he was swept into big, boiling hydraulic," said Peter Christian, chief ranger for the 13.2-million-acre park. Christian was part of a team that included volunteers and the Alaska Air National Guard who spent the weekend searching for Kehrer. His body was found Sunday on a gravel bar about 4 miles below where he put his packraft in the river. Packrafts are 6- to 7-foot-long inflatable boats weighing 3 to 8 pounds. Despite their small size and light weight, packrafts have proven their durability across the state over the past decade and become famous for running big water when powered by the state's best paddlers. A free-form race A big man, always smiling, who spent a good part of his life in the Alaska wilderness, Kehrer was a competent paddler, a description that would fit most of the participants in the Wilderness Classic. A race of sorts across the wildest parts of the 49th state, the Classic each year attracts only a handful of participants, nearly all of them Alaskans familiar with the dangers of frigid waters, unforgiving climate and grizzly bears. There is no race route, and part of the challenge is finding the best way to the finish line. Thirteen people started last year’s event on a course of more than 100 miles from Thompson Pass through the Chugach Mountains to the tiny community of McCarthy, but only five finished -- Kehrer among them. Twenty-three started this year and only nine have finished so far. Kehrer, like some others, was trying a new route using the Tana to try and avoid alder thickets so dense that last year he described them as near impassable. "It made sense to crawl for short distances because no matter what you chose to do, it was going to be slow and expend a lot of energy," he said in a Facebook message exchange after the race last year. "Roman (Dial) was a genius last year wearing shin guards and arm guards on his forearms....The bushwhacking was awful because the density of the alders with devil’s club (and) the amount of fallen spruce trees. The height of brush made it difficult to see the ground so many times you would step into holes because of old fallen trees and such ... Also, the bugs were very unfun." The 2013 Classic was tough, and the 2014 event got off to a bad start amid news that Cody Roman Dial -- Roman's son known simply as "R2" to many Classic participants -- was lost and missing somewhere in Costa Rica. He has still not been found. R2 became the youngest ever to finish the race when he completed the Eureka Summit to Talkeetna course in 2004 at age 17. His father is a four-time winner, a former race organizer and a veteran of more than 10 Classics. His mother, Peggy, still holds the fastest time ever run by a woman. She did the Brooks Range course of more than 100 miles in about three days in 1993. There was talk of canceling the Classic because of the search underway in Central America for Cody Dial, but the Alaska event went on anyway, with competitors vowing to proceed in the spirit of the Dials. They also took their $200 race fees, which normally go into a rescue fund in case of emergency, and donated the money to a fund to help Roman continue search efforts in Central America. Then everyone headed off for Thompson Pass, thinking that at least this was the last year to deal with the Classic on what everyone agreed was a hellish course. The race is due to move, if it continues, next year. It has historically been run only three years in a row on any route to prevent regular competitors from gaining an advantage thanks to experience gained in determining the best race route from start to finish. "We don't know what will happen with the Classic now," volunteer coordinator Luc Mehl said Monday. "The community will have to process it." Iditarod Trail Invitational volunteer The Classic community is small -- numbering fewer than 500 people -- but it represents the most experienced wilderness trekkers in Alaska. Kehrer was one of this group, a man perhaps more comfortable in the wilderness than the city. For many winters, Kehrer helped Bill Merchant of the Iditarod Trail Invitational pioneer the Iditarod Trail to the remote Rohn checkpoint in the Alaska Range every February. The two men would punch the trail through Rainy Pass and down into the rugged Dalzell Gorge before Iditarod race officials, let alone Iditarod mushers, arrived. Then Kehrer would hang out in Rohn to man the checkpoint for the Invitational. Invitational competitors came to know him as the always-smiling guy who kept the checkpoint wall tent warm, made comfortable places for everyone to sleep, and kept stuffing people with food. "Everybody who describes him talks about his big heart," Mehl said. "He really embodied the spirit of Alaska." Kehrer, a big man of more than 200 pounds, was never going to win the Classic. He knew that, but still enjoyed the challenge of every race, and he regularly embraced the opportunities to help out others struggling across the wilderness. Last year, he happened on the packraft of Steve Duby after Duby flipped it, lost it, and swam the Tasnuna River on the first day of the competition. Kehrer made sure to tie the raft up on a gravel bar where someone continuing downstream couldn't miss it. Duby, a school teacher in the remote village of Nulato on the Yukon River, was working his way downstream trying to figure out the best way to abandon the race when he came upon the raft. He got in and eventually became the first to finish the 2013 Classic, thanks to Kehrer's help. Swimming is something a lot of people do in the Classic. Mehl said seven people used the Tana River route this year and at least two of them ending up swimming before Kehrer -- both in dangerous Class IV whitewater upstream from where Mills and Kehrer put in. Both got out OK. Kehrer and Mills intentionally avoided that stretch of the river. "They actually put in below the worst of the gnarly," Mehl said. "They walked way out of their way. Rob's always been afraid of water, though he's swum a bunch." The Classic is a competition that normally rewards good judgment, route-finding and sometimes fire-making abilities more than paddling efficiency. Fire is a lifesaver in a situations where people face deadly hypothermia. At least one past Classic participant might well have died on a different route through the Wrangells more than 20 years ago after a raft accident left him washed up the bank of the Nizina River. Another competitor happened along and started a fire to save him from death by exposure. How Kehrer died is unknown. He could have drowned or been killed by hypothermia after washing out of the whirlpool, but Christian said there is no indication that he was conscious when he washed up on the gravel bar. After Kehrer disappeared, "Greg (Mills) got safely past the hole, grabbed up all the gear" that had come loose from Kehrer's raft and was floating downstream, Christian said. Mills then went to shore to start searching for his buddy. "He ran up the bank hoping he'd find him and never did," Christian said. Searchers in a Park Service helicopter and in Pavehawk helicopters of the famed Alaska Air National Guard’s 210th Rescue Squadron from Joint Base Elmendorf Richardson spent hours airborne over the weekend before they were able to locate Kehrer's body, the ranger said. Kehrer was wearing dark rain gear and a dark personal flotation device. Mehl, who talked to Mills after the accident, said he believes Kehrer's boat was flipped by a powerful, boiling eddy along a cliff where the Tana makes a 90-degree bend. The late Dr. Andrew Embick of Valdez warns of these "powerful, boiling eddies" in his book "Fast & Cold: A Guide to Alaska whitewater." The Tana canyon in 1988 claimed the lives of 44-year-old Larry Holmstrom, his 21-year-old daughter Maria and 31-year-old Ron Eagle while they filmed an episode of "Jay Hammond's Alaska." Hammond, now deceased, was a two-term Alaska governor and the first governor to host a TV show about Alaska. He, too, went into the water in 1988, but was pulled safely back aboard a raft rowed by Paul Claus of Ultima Thule Outfitters. A legendary Alaska Bush pilot, Claus runs a lodge not far from the Tana. He was the first person Mills called on a satellite phone after the accident, and Claus began an aerial search for Kehrer almost immediately. He saw nothing. "We didn't get a call until the next day on Sunday," Christian said. "But there's probably nothing anyone could have done anyway." Kehrer's wife, Tamra, was in McCarthy waiting for her husband and other race finishers when she was notified of her husband's death. Mehl said she had friends with her and was hanging on. Everyone who enters the Alaska Wilderness Classic knows the dangers. The liability waiver has for years contained very blunt language informing Classic competitors about the risk of death, but dealing with it is hard for family members who wait for the event to finish. Fifty-seven-year-old Anchorage surgeon Dr. John Lapkass, a husband and father who has completed more Classic races than anyone, almost died on a course in the Fortymile River country of Interior Alaska in 2010. He suffered internal bleeding during the race, but was able to make a satellite phone call for a helicopter, which picked him up and flew him to surgery in Anchorage. A 42-year-old man drowned in Tomales Bay last Saturday while training for a canoe race with a friend. Emergency crews pulled the other man to Hearts Desire Beach and flew him to Petaluma Valley Hospital, where he was treated for severe hypothermia. One man was pronounced dead and another was hospitalized Saturday afternoon after their canoe capsized in the waters of Tomales Bay. Marin County fire officials believe the two men had been in the 54-degree water for about half an hour before they were spotted at around 12:50 p.m. by a couple walking along Heart's Desire Beach in the Point Reyes National Seashore. "National Parks brought their boat into Tomales Bay, and Inverness Fire volunteers were able to bring both victims to shore at Heart's Desire Beach," said Captain Todd Overshiner of the Marin County Fire Department. "CPR was started on the one who was unconscious. The other was severely hypothermic." Information about the two victims, both males in their mid-40s, was unavailable at press time. One man was pronounced dead on the beach, while the other was flown by helicopter to Petaluma Valley Hospital. While both men were wearing personal floatation devices, neither was wearing clothing designed for cold water, Overshiner said. Without that equipment, hypothermia would have set it "relatively quickly" in the 54-degree water, Overshiner said. Saturday's death was the first at the National Seashore since a child drowned while swimming outside Whitehouse Pool last summer, Overshiner said. The sea kayaking season is here again, although for some it never left, enjoying Lake Erie during Winter months just the same, wisely or unwisely. The attached report about the accident we remember from news paper accounts last year follows. Sea Kayaker magazine contacted me at that time to help them to get in touch with the Cleveland Coast Guard for their accident report. They just sent me a rather poignant report written by a kayaker who knew the victim. 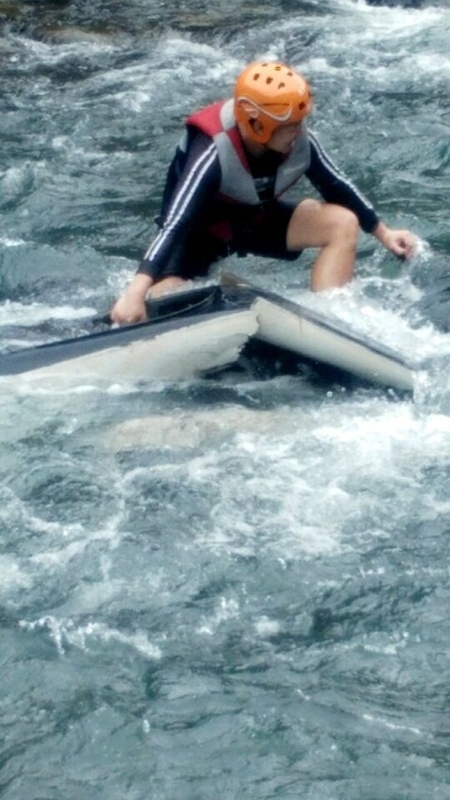 Sea Kayaker maintains and analyzes accidents. In their June 1999 issue there is a rather sad article about a fatality that happened in Greenland waters also due to lack of rolling skills. Please respect big water because of the potentially larger distances from shore that you could negotiate safely by swimming if all else fails. Going alone is a well known hazard. It is your decision weather you have the skills, or you are over confident, like this Navy man was. Big water can turn from best friend to worst enemy in a very short time. Closing my own remarks I just say that instinctive rolling is just as important to sea kayakers as to river rats who are superb experts at that. Sea kayakers should become superb experts at it also instead of blind trust in the stability of the wider boats. Rolling is the quickest out of a potentially deadly situation. Set up your boat for rolling!! Practice it every time you are out on water, it is a nice way to cool off too in Summer heat, I use it as my climate control. See you on the Lake. For a brief review, Rhino went out on a solo paddle to "the crib", a highly visible structure about three miles offshore that serves as an underwater inlet for Cleveland's water supply. It's something of a landmark in the area, apparently. (He had tried to go out to the crib three weeks earlier, but had turned back because of fatigue.) The day of his death, he was wearing a blue dry suit, a yellow type III PFD, skirt, booties and gloves, and was found three quarters of a mile east of the crib, separated from his boat, a yellow over white fiberglass Necky sea kayak (hull number GNK08246G298 --- a new boat) with his paddle attached to the boat by means of a paddle leash. The water temperature was 50 degrees F. at the crib intake point, 35 feet below the surface; we can presume that the water temperature at the surface would probably have been closer to 45 degrees F. Winds were light and there was only low chop. The boat was found at a considerable distance from the body. So the final question: what was the cause of death? The Coroner's report states that Rhino died of "immersion hypothermia and drowning". From some familiarity with cold water paddling, we can assume that hypothermia resulted in a loss of physical control which then resulted in drowning. Earlier suggestions of cardiac arrest were, apparently, incorrect. He became hypothermic and eventually drowned. What went wrong? In this case, there are a few things that jump out. - Rhino was a relatively new paddler. (He and I had discussed sea kayaking in the past, and I knew that he had been interested in becoming involved in the sport; the reports and conversation with the family indicated that he did have at least some sea kayaking training. We lost contact after his retirement from the Navy a couple of years ago.) But he had only one year's experience and was paddling alone, offshore, in "cold water" conditions. Whether or not we choose to see that as significant in general, it was a specific contributing factor in Rhino's death. Had he been with a partner, an assisted rescue might have been attempted; ambient conditions were generally benign, other than the water temperature. Lessons-learned: in "cold water" paddling --- however we choose to define "cold" --- a dry suit is of no value if it is not fully zipped at all times when on the water. Adequate head and neck protection in the form of a neoprene hood or a hood of Malden Mills "Thermal Stretch" or "Rubberized Thermal Stretch" or similar composite material, is absolutely essential, and should arguably be worn at all times when on the water. (There are proponents of carrying a hood as opposed to wearing one; there is evidence in this case that suggests, since Rhino could not close the zipper in his dry suit, he might well not have been able to put on a hood, once in the water, if he had had one with him. Of greater significance, once he had capsized and was in the water, the initial damage of cold shock had begun, with the intense head and facial pain of cold water entry and consequent disorientation contributing directly to his inability to recover on his own.) And we can speculate that, even if the zipper on his dry suit had been closed, the lack of thermal protection to his head and neck --- where a swimmer loses the vast majority of body heat in any event --- and the apparent absence of thermal insulation under his dry suit would have induced hypothermia and resulted in death by drowning almost as quickly as it probably did in this case. Conversely, had he had his dry suit fully zipped, had he been wearing a hood of neoprene or functionally equivalent composite material, and had he had appropriate thermal insulation under his dry suit, his capsize under the existing environmental conditions could easily have resulted in a self rescue or a survivable float until assisted rescue could have occurred. The bottom line: I joined a few hundred people --- family and many friends --- to bury an old Navy buddy at Arlington National Cemetery on a cold, bright morning last December. The ceremony was impressive --- the flag-draped casket on a horse drawn gun caisson, an honor guard, a band --- with full military honors and taps called away by a bugler. But it was an unnecessary trip to Arlington. It could have been prevented by the buddy we went there to honor. If something good ever comes out of incidents like this, you've read about a preventable death of a fellow sea kayaker, and maybe you'll build the contributing factors to the event into your preparation for your next trip. Thanks for reading this note --- I hope it wasn't as much of a terrible use of time for you as listening to that bugler was for me. The victim got tangled in a rope, lost balance and fell head underwater while trying to free a pinned boat, couldn't free himself. One of his buddies cut the line and swam to the rescue, helped by another boater. All three were experienced. The victim was in a coma for almost 4 days, but has recovered completely. Two coast guard volunteers are dead after a boat capsized Sunday morning in Skookumchuck Narrows, near Sechelt on B.C. 's Sunshine Coast. Capt. Annie Djiosta, a public affairs officer with the Royal Canadian Navy in Esquimalt, said a rigid hull inflatable boat with four people on board capsized at about 11:30 a.m. PT. "Of the four people on board … the boat, two were rescued almost immediately thanks to people on board a vessel that happened to be on the scene of the incident," Djiosta said. "The other two people were pronounced dead … those two people unfortunately were trapped underneath the hull." Djiosta said the victims were both female, while the two people pulled from the water were men. Capt. Justin Olsen with the Joint Rescue Co-ordination Centre Victoria said the boat may have been out training. "This is the first case I've heard of where they've had an accident of this severity," he said. "We're quite shocked to learn that it was part of the search and rescue community and we were surprised." Olsen said the Skookumchuck Narrows is a popular area for thrill-seekers. He said the current there is rapid, but it's too early to speculate on the cause of the accident. Peter Sly, fire chief of the Egmont and District Volunteer Fire Department, said he watched the rescue from his home and saw several boats trying to respond to the overturned inflatable. Sly said the rescue lasted more than two hours and drew the Canadian Coast Guard vessel Cape Caution, a Buffalo aircraft, Cormorant helicopter, members of the Royal Canadian Marine Search and Rescue from Pender Harbour, B.C., as well as local boats. Sly said the area can become dangerous, especially when tides as large as 5.5 metres rush through the narrows of the local inlet, forming waves and whirlpools. At the time of the accident, the current was running at about 24 km/h, said Sly. "Several people have lost their lives over the years in the rapids," he said. Federal Fisheries and Oceans Minister Keith Ashfield released a written statement Sunday evening saying he was "deeply saddened" to hear about the deaths of the two volunteers. "I would like to express my sincere condolences to their families, friends and crew members. As search and rescue partners there to protect Canadians on the water, the Canadian Coast Guard shares the pain of this tragic loss," read the statement. "The volunteers in the Royal Canadian Marine Search and Rescue team and the Coast Guard Auxiliary make up a crucial part of the marine search and rescue network in Canada. Their commitment and dedication to saving lives, with all the dangers associated with marine search and rescue missions and training, is second to none."